Compost, manure, and synthetic fertilizers are all widely used for soil application in production agriculture today. Each of these fertilizers has its own set of advantages and disadvantages. In Part 1 of this series I will briefly define and describe the relative values of these three fertility inputs before expanding on the effective use of compost, which I believe to be the most valuable of the three for profitable, sustainable, commercial farm operations. 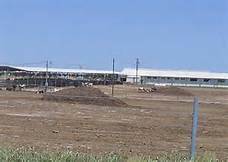 MANURE is the waste product of animals (and plants: see green manure – a subject for another post), usually only commercially available from animals confined to a feedlot operation where the waste product is convenient to gather. Where locally available, manure is valued for its low cost and high organic matter content. At the generally used rates of 10-20 tons per acre, it provides significant plant nutrition and organic matter beneficial to soil structure and plant growth. However, untreated manure requires specialized application equipment and can introduce unwanted weed seeds to the farm. If the manure is anaerobic (left wet or compacted for a period of time) toxic organic compounds may form and inhibit plant growth for some time after application. This last problem can usually be mitigated by allowing the manure to age or applying and incorporating the manure several months before the target crop is to be planted. An additional consideration is that a significant portion of the nutrient content of manure is water soluble and can be leached from the soil in adverse weather conditions. Generally speaking, “SYNTHETIC” or “CONVENTIONAL”fertilizers are inorganic, mined or synthetically produced minerals that have gone through a manufacturing process to make them more pure and/or more water soluble. They are valued for their consistency, reliability of analysis, and concentrated nutrient value. This last attribute makes them easier to transport long distances and store out of the weather. Because of their high relative water solubility, they are also valued for their ready availability for plant uptake once applied to the soil. Additionally, a single fertilizer applicator can put out a wide variety and analysis of various synthetic fertilizers. Some common examples of these fertilizers are Ammonium Sulfate, Diammonium Phosphate, Potassium Chloride, and Urea. On the down side, the water solubility of these materials though can be a two edged sword. The fact that they move with water makes them highly susceptible to leaching out of the root zone, especially in sandy soils. If this happens they are not only “wasted” in terms of availability to the plant, they also become potential pollutants in the water table or any surface water they may reach. In addition, “synthetic” fertilizers contain little or no carbon, thereby negatively impacting soil health over the long term unless compensating farm practices are employed. COMPOST is the result of the decomposition of anything that was once alive – in general, the bodies of plants, animals, and their waste products. This decomposition process is accomplished mostly by microorganisms which use these raw materials (plus oxygen and water) as a food source. Aerobically produced compost is considered the most beneficial for plant growth for many reasons which will be explained in additional parts of this series. Common sources of feedstocks for commercial composting operations are: manure from animal feedlots; agricultural wastes such as “gin trash” (cotton gin waste) and sugar mill pulp (bagasse, mill mud, etc); food wastes; and tree/brush trimmings. Compost is valued in production agriculture for several reasons. It has most of the same positive characteristics (nutrient content, organic matter) as manure without the likelihood of toxic organic compounds and without weed seeds – both of these are destroyed and repurposed in a properly designed aerobic composting process. This process also links or “ties up” the water soluble plant nutrients with the carbon present in the pile. This linking prevents any significant leaching of nutrients from the soil after application as can be a problem for both manure and synthetic fertilizer. In addition, many of the same microbes that decompose the raw materials in an aerobic compost pile are highly beneficial once applied to the soil. 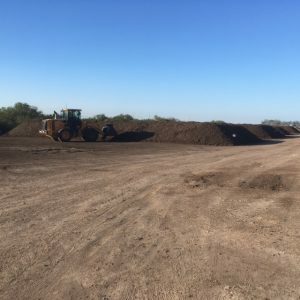 Despite its advantages, there are barriers which may prevent the use of compost; it is not always locally available and can’t be shipped economically much more than 200-300 miles. It also requires handling equipment that is specialized and not always readily available. Next in this series we will take a look at some of the ways (and reasons) that compost is superior to manure and synthetic fertilizer as a commercial fertility input. Contact Us for help or product questions.